The ninth installment in the 'STAR WARS' film franchise (12th counting two made for television 'EWOK' movies, and an animated film). It picks up right where 2015's 'STAR WARS: THE FORCE AWAKENS' left off, and revolves around Rey teaming up with Luke Skywalker, Leia Organa, Finn, Poe, and others, to defend the galaxy from the First Order, and the dark side of the force. The movie was written and directed by Rian Johnson (who also helmed the critically acclaimed 2012 sci-fi hit 'LOOPER'). 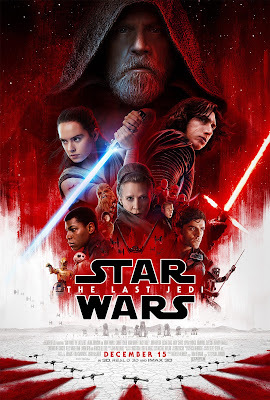 It stars Daisy Ridley, John Boyega, Adam Driver, Oscar Isaac, Mark Hamill, Carrie Fisher (in one of her final film roles), Domhnall Gleeson, Andy Serkis, Anthony Daniels and Peter Mayhew, in returning roles. While Kelly Marie Tran, Benicio del Toro and Laura Dern all join the cast. It's gotten mostly positive reviews from critics, and it's expected to be another huge blockbuster at the Box Office as well, of course. I of course loved it! The film begins with the Rebel Alliance desperately trying to escape an attack by the First Order (in space). At the same time Rey is meeting Luke Skywalker (Hamill) for the first time, in his distant place of hiding, and he is not happy to see her (at all). Rey persistently tries to convince Luke to return with her, to aid the Resistance in their great time of need, while General Leia Organa (Fisher) is harmed in an attack, and put into a coma. Poe Dameron (Isaac) concocts his own plan to get the Alliance out of danger, against the orders of the new Admiral (Dern), and he finds help from Finn (Boyega), and a new friend named Rose (Tran). Kylo Ren (Driver) also deals with his own inner struggles, in dealing with the force (and his fate), as does Rey. The movie is surprisingly unpredictable, and filled with shocking twists. The suspense, and action scenes, are also really well done, to the extent where I was literally on the edge of my seat, throughout a good chunk of the whole movie. The humor is a little too comedic, for a 'STAR WARS' film (in my opinion), at times, but the emotional drama, and character development, is more than most fans could even ask for. There's also really effective social commentary, on corrupt government and big business, and there's even a few scenes promoting veganism, and animal rights, which I loved. Most of all, the nostalgia of the whole thing is once again breathtaking (I cried multiple times). Being a huge fan of 'STAR WARS', I was definitely more than pleased with this installment. It might not be quite as good as 'ROGUE ONE', but it's definitely one of the best films of the year, and I can't wait to see it two or three more times, in the theater!